Qualified occupational therapists work in orphanages, hospitals and care centres near Hanoi. 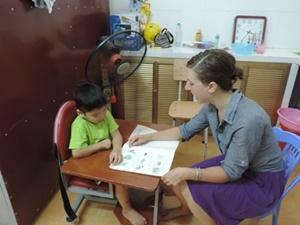 How can volunteer occupational therapists help in Vietnam? Helping the local staff to look after individual children. Assessing the physical, mental and social challenges facing the children. Updating the children’s case profiles and treatment methods. Devising treatment programmes to increase the patients’ ability to tackle their difficulties independently. Observing the children’s progress over a set time period. Working with local staff to find ways of improving the services provided to patients. Running training clinics for Projects Abroad volunteers working in other care centres (optional). The patients you will work with may be aged anywhere between 1 and 20 years old. This project runs all year round so you can join at any time. It is possible to join this project for just two weeks if you don't have time to join us for a longer period. However, please be aware that you may not be able to make the same impact as someone volunteering for a longer period. You will gain experience of working in a developing country with a lack of resources. You will also gain satisfaction from sharing your skills with the local staff and patients, and from the knowledge that treatments have been improved through the training and skills you have demonstrated. Safe accommodation and meals with a local host family, placement accommodation or in a volunteer house close to your project. A member of staff to meet you at the airport when you arrive, show you around and introduce you to your work placement. If you have completed at least a Bachelor’s Degree in Occupational Therapy or a closed related subject then you are perfectly suited to this project. If you are interested in this project but don't have the relevant experience, then please read about our regular Occupational Therapy project in Vietnam.